Tall stubble technologies offer a lot of benefits, but also a few challenges. The key components of a tall stubble system are a stripper header for the combine, a disc drill and tall standing stubble. The stripper header removes the heads, leaving all of the crop residue standing in the field. Growers and researchers are convinced of the benefits. 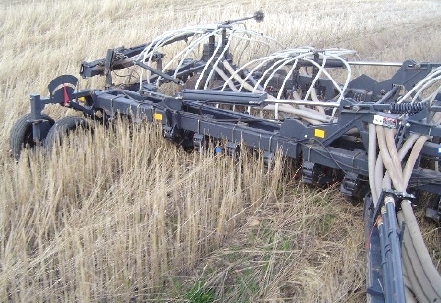 Both growers use a Shelbourne-Reynolds stripper header. “I don’t think there is a serious competitor at this point, and when you use it for as many crops as we do it isn’t a big investment,” says Lanier. Lanier likes to seed in the direction of the combine tracks, so he decides at harvest which direction he will be seeding in the following spring. He also uses narrow-gauge wheels on the disc drill to minimize how much straw is knocked down. During harvest, trucks are kept on the end, if possible, and other traffic is eliminated. If a grower is looking for ways to save time and fuel at harvest, along with other benefits, consider low-disturbance seeding systems and tall stubble technologies. Success means planning ahead and selecting the right equipment combination, including a stripper header, a disc drill and tall stubble. Researchers Dr. Herb Cutforth and Dr. Brian McConkey at the Agriculture and Agri-Food Canada (AAFC) Research Centre in Swift Current, Saskatchewan, have been working on the microclimate impacts of tall stubble technologies for the past few years. They took earlier research showing benefits of leaving standing stubble, including an average increase in soil water at seeding by five to 30 millimetres, a step further and looked at the impact of tall cereal stubble on the microclimate at the soil surface at seeding. Research trials compared various stubble heights including no stubble or cultivated, short stubble of 15 to 20 centimetres (six to eight inches), tall stubble of 30 to 35 centimetres (12 to 14 inches) and extra tall stubble at 40 to 45 centimetres (16 to 18 inches) high. Several climate parameters were measured throughout the growing season, including soil temperature, wind speed, evaporation, air and plant temperatures in the stubble. The results confirmed that wind speed at the soil surface in tall stubble was reduced to 30 percent of the wind speed at the soil surface of a cultivated seedbed with no standing stubble and up to 85 percent in short stubble. Evaporation at the soil surface is much lower with tall stubble, reduced by 30 percent compared to a cultivated seedbed with no standing stubble. The effect of reduced wind speed on plant and air temperature near the soil surface was extremely variable and dependent on water availability. However, during the research, no differences were found in crop development between direct seeded or cultivated seedbeds. Yields were higher for all crops under taller stubble conditions and increased as stubble height increased to at least 45 centimetres (18 inches). The yield benefits were fairly constant across all crop types, including canola, pulses and cereals. Under tall stubble conditions, yields increased by 10 to 15 percent compared to cultivated conditions, and short stubble yields increased by five to seven percent. Canola appears the most responsive to stubble height, and researchers are now looking at the microclimate impacts of tall canola stubble.